A very gripe rubber with built-in speed-glued effectChinese standards a soft rubber with emphasis on control and swerve through the thin upper layer of the rubber is very easy. The rubber is ideal for the spin-oriented attack player who does not want to miss out on the highest level of control.The rubber is sealed delivered, thus ensuring that the built-in speed-glued effect is not damage.In summary one can say that the MOON is currently the best rubber for the variable attack players, what the Chinese developers have on offer. Above all, the unbeatable price-performance ratio makes it look bad for Japanese competition. 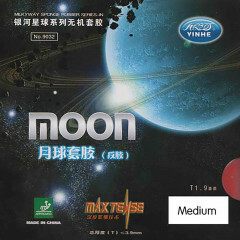 Milky Way/Yinhe Rubber Moon Medium is beeing added to cart.